You also may want to check out the ECTACO EEL400T. 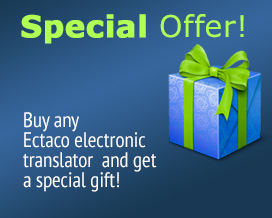 This advanced electronic dictionary also features an extended vocabulary, flash card games and can be linked to your PC. A Bonus CD is also included offering software to extend and expand your dictionary’s functionality. Compare these models and discover the differences! User’s manual available in both Spanish and English.